As a New Yorker, I excelled at urban hiking. There is plenty of flat terrain there, but there is also flight after flight of staircases to climb, both over and under the ground. Since moving to Los Angeles, I’ve been hiking mountains and canyons. My hikes in New York were part of my transportation system. (I used to say “My legs are my car”.) But the LA hikes are different. They are simply for the hike itself, for the climb. 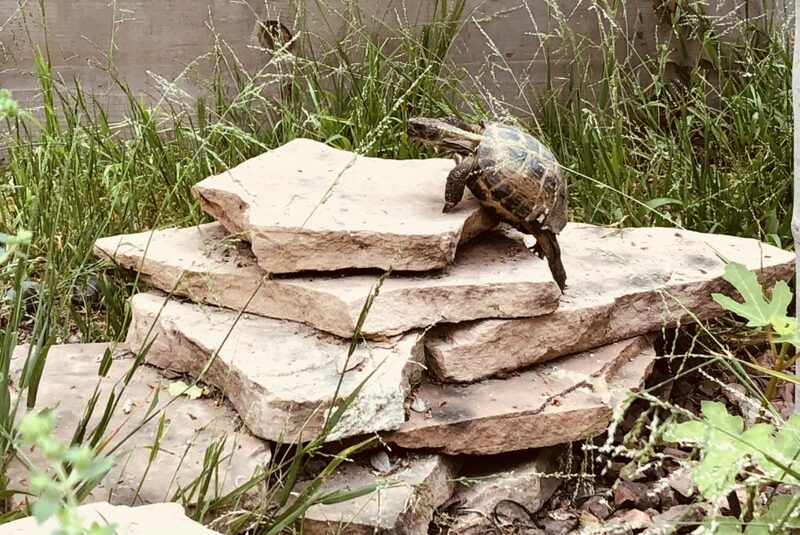 My neighbor, the tortoise, set out on his own climb recently. I marveled at his persistence and grace as he lugged himself to the top. Once he was up there, he didn’t stay long. With a sudden motion, he stepped off the top rock and awkwardly slid and bumped all the way back down. Trinity Bourne says we climbers don’t wait for permission to climb. I say we climbers don’t wait for a reason either. To climb is reason enough. What have you climbed recently?